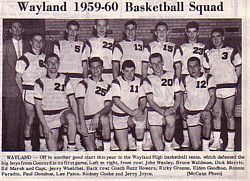 After researching Wayland High School basketball in the 1950s, it appears that the team represents larger social and athletic trends nationwide. To get a better idea of what the 1950s were like beyond a basketball sense, two interviewees answered questions that stemmed beyond the topic of basketball. 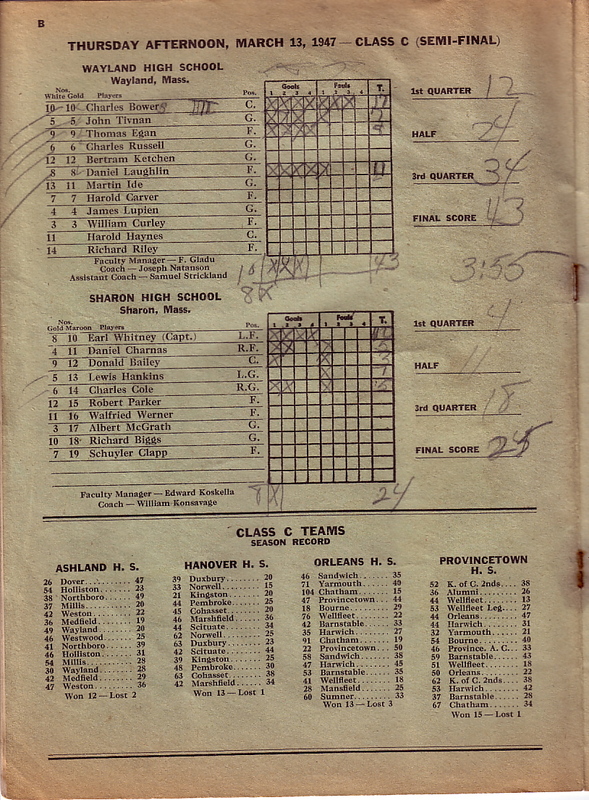 The two Wayland High School basketball team members interviewed were George Bradley and Charles Roche. Both were members of the 1957 team that went undefeated and won the state title. Their stories make it clear that Wayland High School represents larger national trends. Americans in the 1950s were into conformity and there were fewer rebels questioning authority. Wayland High School was no different, as George Bradley recalls: "The bad kids were taken care of by the good kids". In an educational sense, Wayland High also epitomizes the larger American picture. Throughout America, fewer students went on to attend college after graduating high school as compared to the modern-day country. Wayland High was no different. Last year, 97% of the graduating seniors continued their education at some form of college. It was "50-50 in those days", according to Bradley. As far as basketball went, the themes were quite different as well. A greater team concept was preached, with less emphasis on individual glory. 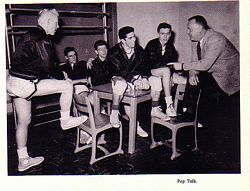 In 1960, Chuck Orsborn, the head coach for NCAA champion Bradley University, wrote Basketball for Boys, a book on how to become a basketball star. In it, he stressed fundamentals and team dynamics. In his "faking" section, he said, "There is no purpose in making a fake just to draw your defensive opponent off balance for the 'fun' of making him look bad. 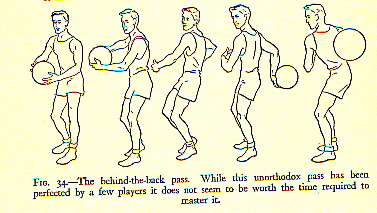 This couldn't be farther from the truth of the way NBA superstars play the game today. George and Charlie both concluded that a strong team concept and respect for their coach and players were the keys to their state title victory. 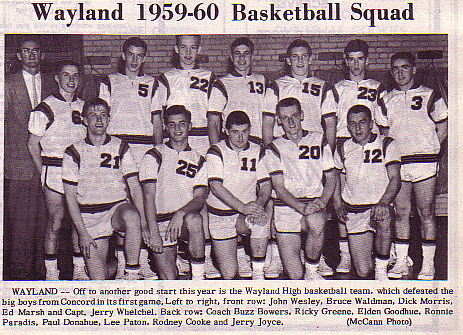 The Wayland High team seemed to be a microcosm of the Celtics during their dynasty. Both had a huge following of faithful fans, and both teams operated off of the "no 'I' in team" ideal. Just as the basketball superstars were looked up to by American citizens, the Wayland jocks were looked up to by their classmates. They received no special treatment, and were expected to be role models for the rest of the student body. Whereas jocks today tend to do the minimum to get by, the players of old felt they had to work that much harder to set a good example for the rest of their fellow students. As the two interviews will show, there were many aspects of the 1950s that contrasted sharply with the world we live in today. If you look closely, you will also be able to perceive that the Wayland High School basketball team embodied the macro-trends through their work ethic, values, and respect. Charles "Rocket" Roche was the sixth man on the 1957 undefeated state champion Wayland High School Basketball team. He played forward and guard, and hit the game winning shot in the state title game at Boston Garden. He currently lives in Wayland. What were, in your opinion, themes running through the 1950s? It was more of a carefree attitude then. Of course we didn't have the stuff we do now. We didn't have to worry about terrorism and things like that. We were more focused on our own little world, I think. It was an easier time to live. I would hate to be a student today, it's too difficult now. There's a lot brought on us. What was it like in terms of conformity, were people generally more respectful, and was work ethic stronger? You always tend to think so, but I'm not sure it was. You'd like to think it was. I was the Class of '57 and we only had 42 students. It was good to know everybody, and it was good to know everybody's business and things like that. In a sense it was conformity, I don't know, it's hard to put in words. You knew everybody, and you knew what was going on in town because it was such a small town then. You still had people doing their own thing, there just weren't as many as there are today. Discuss the team dynamics and the relationship with your coach. Were respect and a strong team concept important back then? I think so. We had two coaches. I started out with Sam Strickland, and then we had Charles "Buzzy" Bowhers. I think things improved with Buzzy Bowhers. He had a little more discipline, he set plays, he knew what he wanted to do, and that was it. So I think we had more respect for Buzz Bowhers--'57 was first year I think, or something like that. 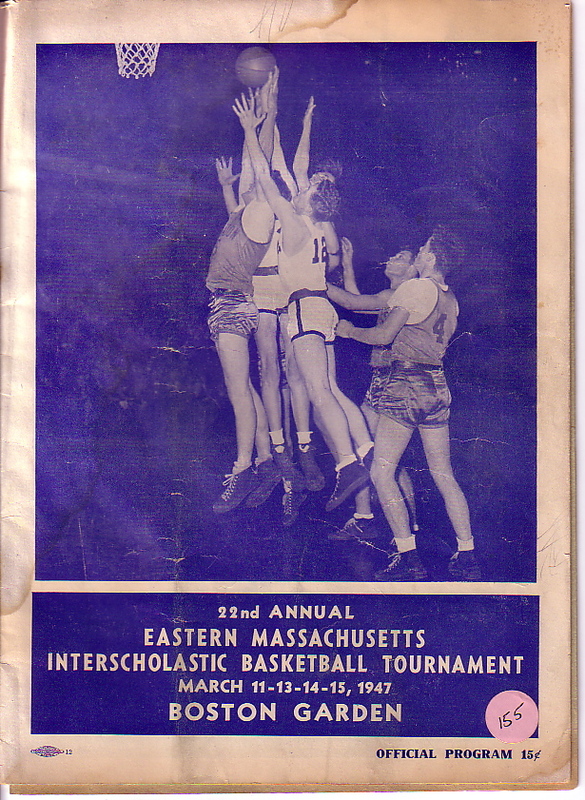 What was it like to play high school basketball in the 1950s and how do you think it's different than high school basketball today? Today there are so many more opportunities for the kids. Like when I was playing, we didn't have these Longfellow sports clubs at all. I would have lived down there when I was fifteen or sixteen. All of us could have been a lot better. We didn't play enough. Today the kids can play year-round, there's too many opportunities. Of course we always had the TECH tourney to look forward to. Now it's a little different with the set up and the state tournament. It's still exciting, but I think it was a little bit better then. Also in those days you could have a center at 6'3'' and get away with it. That shows you how times have changed. Did you receive special attention in the school by both the faculty and the students? Discuss your most memorable game. 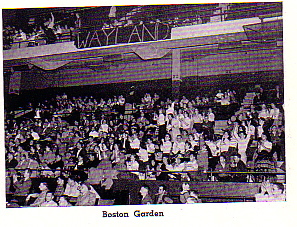 Oh, without a doubt it was '57, the final game in the Garden. The score was tied. I was the sixth man on the team, and I had to come in. We were playing against an exceptional player on West Bridgewater who went to captain Brown University. He had 35 points at that point. I came in near the end of the game and I got fouled, so I had to do a one-and-one. Try to do a one-and-one situation when you come in cold in the Boston Garden, and you're sixteen years old. You can imagine that. Anyway, I made the one-and-one. I don't know, and to this day I still don't know how (laughs). I made the one-and-one and we won the game 71-70. Was there a lot of pressure in the 50s to further your education? There was a push [to go on to college], but nearly as much as there is today. Now they emphasize it in the Wayland schools. In those days you went to school and that was it. We still had kids go to Brown, Harvard, and things like that, but I think today the competition is so good you have to have much more emphasis on it. Why do you think there was less pressure back then? I don't know how many guidance counselors we have now, but we only had one guidance counselor for a lot of people. They did the best they could in the '50s, I think with the technology in the world today, competition is just more difficult. In high school were you involved in national and global issues? Not really, no. Like I said, back in those days, we were more, I wouldn't call it self-centered, but we were more interested in things surrounding us. 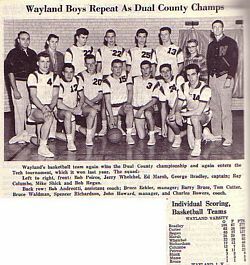 How do you think your state championship team of 1957 would stack up against the regular Wayland High School team today? I think against Wayland High School we would do alright, but against the city schools we wouldn't be because we weren't as quick. [If you want to compete against the city schools] you have to have more quickness. I think we would do alright, I don't think we would dominate anybody. We also just weren't that tall. Our tallest player was only 6'3'' or 6'4'', and that was it. So I think against a tall team we would be in trouble. Against all suburban schools, we'd do alright though. We probably couldn't play against Charlestown or somewhere like that. Back then did people follow pro sports religiously? Personally I did. I went to every Celtics game. I went to every Celtics training camp. I had a more closeness with the players because you knew the players, and the same players would come back year after year. Now with free agency and all, the rosters keep changing so you don't have that love for the game. I was a Celtics season [ticket] holder for many years. Back then we used to go to Hartford to see them. Was there one player you tried to emulate while you were playing? John Havlicek was my favorite. Of course everybody liked [Bob] Cousy back in the '50s. John Havlicek was the epitome of a basketball player for work, ethic, and things like that, and he didn't get into any trouble in those days. I think it was different. You didn't hear about contracts all the time, and of course free agency and all that stuff. Players would come back year after year. It was good to know everybody. What kind of town was Wayland like? I liked it thirty years ago to tell you the truth. We had farm stands. I live on Oak Street, and there was a farm stand at the end of the corner. We had farms across the street, and now we have condominiums, which was inevitable of course. We had good farm stands, and people you just can't replace. Now people are kind of into their own selves, and we don't have that camaraderie I don't think anymore, and neighborly things and things like that. Do you think not only Wayland citizens but American citizens' values were different than they are today? It's hard to say, you know there are so many pressures on people today. I think the basic values are the same from generation to generation. I don't think they change. We're brought up a certain way; what's right is right, and what's wrong is wrong, things like that. I think basically the core values don't change. There's too many pressures today on people. They're running here and there, like the soccer moms. They're here, there, they're everywhere. Have you maintained friendships with people on your high school basketball team? Not really. Some of them moved away. I just see them once in a while now. We've just a few reunions and things like that. Have you lived in Wayland your whole life? I moved to Wayland in '53. Did you play college basketball? I played a little college basketball at Newton Junior College. We won our title there in the Garden too. Do you still play basketball recreationally? No, I'm too old now. I had two knee operations, things like that. The mind says yes, the body says no. George Bradley was a junior on the 1957 undefeated state champion Wayland High School basketball team. He was a starter at the forward position, and shared the spotlight with the other stars, Nick Willard, George Richardson, John Washek. He was a three sport athlete, and was a star on both the football and baseball teams. He went on to college football. He currently lives in Sudbury. Were you native to Wayland? What was in your opinion a theme running through the 1950's? We're talking about an era where work ethic was very important. Hard work, doing the right things, and obeying the laws and regulations were very important. There was an awful lot of respect back in those days. Take the basketball players for instance:�they respected the coach, the respected the school, they respected the police department, they respected the clergy, they respected their parents. There was an awful lot of old fashioned, traditional conservatism. So there were far less rebels back then? Absolutely. And a lot of that was that the rebels got taken care of by the students themselves. Bad behavior was inappropriate, and bad behavior, whether it be smoking or doing the wrong things and not obeying the rules and regulations were pretty much taken care of. The bad kids were taken care of by the good kids. In many instances it never even got to the school authorities or to the police or anything like that. They [the rebels] were pretty much outcasts among the good kids. And most everybody was good. What was like to play high school basketball in the 1950s and how do you think it's different than high school basketball now? First of all, we were fortunate enough to have very good teams, and were also fortunate enough to play in the tech tournament every year, which meant a trip to Boston Garden. That's where the tournament was played back in those days. For the four years that I was there, I played in the Boston Garden. That was a thrill. Basketball then was more structured, there were more lay-ups, lower scoring, tight defense, and the biggest difference between basketball then and basketball now is the athletic ability of the players that are playing now. They could do things that we never even thought about doing. If we had a whole season and saw one kid who could dunk, that was an unusual thing. Now on most high school teams, usually at least one kid can dunk. They are much more athletic, and are much better athletes if you will, in regards to their height; they are bigger, stronger, faster, they jump higher, they are much better basketball players than we ever thought there could be. Did the basketball players and athletes in general receive special attention from the school regarding studies and discipline? If anything, it was probably the other way around. We had to work a lot harder in class because we knew that we were athletes, and were being looked at by the rest of the school. And our coaches made it very clear that the athletes should do their share and more in the classroom to make sure that they weren't identified as 'jocks'. Did the students treat you differently? We were looked up to in regards to being on the basketball team. It was an honor to be a participant on the varsity basketball team. 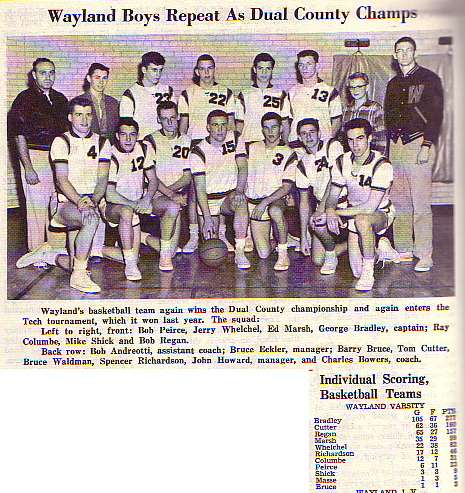 Back in those days there only three sports played at Wayland High School: football, basketball, and baseball. Those were the three sports that a male athlete could play. And because there were no other sports to conflict with them, everybody went to the basketball games. Our games were Tuesday afternoons and Saturday nights. And if you didn't get a ticket early in the week, you didn't get into the gym because there just wasn't enough room for all of the people to come in and watch the game. And it didn't make any difference whether we were in Weston, or whether we were in Dover, or Sudbury. It didn't make a difference where we were. The gyms were full for every single game. And a lot of that was because of the restricted number of sports that we had. The basketball players were very well thought of. We represented the school. We represented the town. And there was an awful lot of school spirit behind the basketball team every single year. Were there any African-American athletes in Wayland High School? None that I know of. In fact, very seldom did we even oppose one. This was well before the METCO program. Discuss your most memorable game. That's pretty easy. My junior year (1957) we had a very very good athletic program. 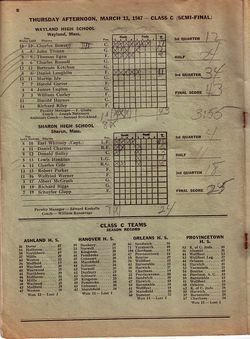 We had gone undefeated in football and won the class D championship, we were undefeated in basketball, ending in the most memorable game, that being a double overtime victory at Boston Garden against West Bridgewater. It was a very exciting game. Was there a lot of pressure back then to further your education after high school? a far cry from today. Were you interested and involved in national and global issues in high school? I think to a certain degree. We are talking about the era between the second World War, and the Korean War. I knew at one point in time we had draft then too. All the males had to register for the draft before or on their 18th birthday. So you had good feeling that sometime along the line you were going to end up in the service. That would have been an issue. Did people follow pro sports religiously like people do today? Oh yeah, oh yeah, there's no doubt about it. You know, the Bruins, the Celtics, and the Red Sox were as popular during that era as they are now. Were there certain professional basketball superstars who you tried to emulate when you were playing? I think that a lot of the kids at the Wayland High School wanted to follow the Celtic winning tradition, and the team tradition. So there wasn't as much emphasis placed on the individual? No, not on the individual. One of the things that I recognized was that through all of the winning seasons that the Celtics ever had, all the winning tradition, they never had a scoring champion. They never had a person who led the league in scoring, which is phenomenal when you think about all the winning seasons that they had. And we kind of fell into that same feeling that we were a team. We played as a team. And the team concept surpassed any individual accomplishments. What kind of town was Wayland like? Was it similar to today?It was much smaller, obviously. It kind of revolved around the Raytheon company, which came into town somewhere in the early fifties. And at that time when they built the Raytheon plant on route 20, there were more telephones in the Raytheon plant than there were in the rest of the town combined. And Raytheon brought an awful lot of people into the town. It built up the population within a six to eight year period. The town was kind of divided between Wayland and Cochituate, with Wayland being the richer side of town, and Cochituate being the place where the poorer kids were brought up, if you will. Weston and Sudbury were our main rivals. Wasn't the Alumni Game pretty big? Oh sure. That didn't mean much, but the Alumni Game was when the hotshots came back to try to prove to the other guys that they could still play basketball. I wouldn't want to try it again [laughs]. Have you maintained friendships with people from your high school basketball team? Absolutely. [I made] life-long friends. No. I went on to play college football and as such I was kind of restricted to play football. I wanted to play baseball, and I was nowhere near good enough to play college basketball. Do your children play basketball or do you think they will? My boys still play hoops every once in a while, but not organized. I have a daughter at Lincoln-SudburyHigh School who currently plays varsity softball, and plays varsity volleyball and basketball. Do you think that the Wayland High School basketball team was a microcosm of the themes of American society, in terms of the fact they had respect for one another, displayed a team concept, and worked hard?